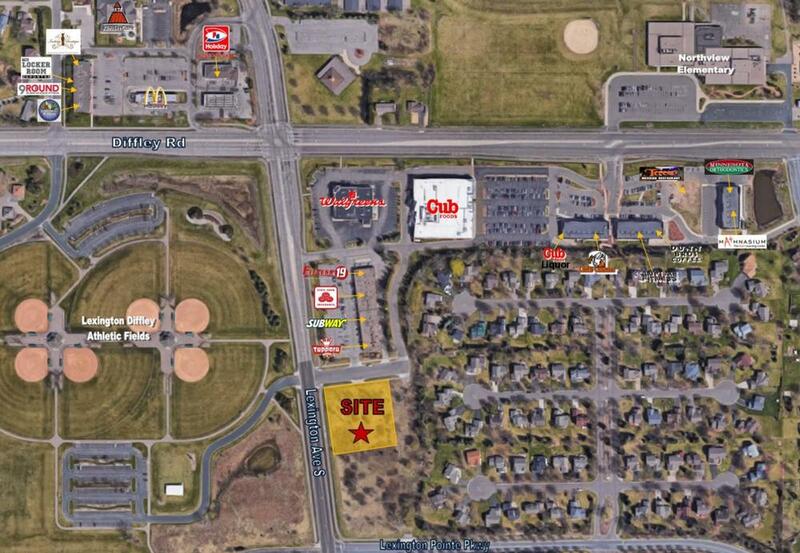 This land is located at the southeast quadrant of Lexington Avenue and Diffley Road in Eagan, MN. This land is positioned seconds from the fairly new Cub Foods Development along Diffley Road which has attracted retailers including Walgreen’s, Any-time Fitness, Great Clips, Little Caesar’s and There-sa’s Mexican Cuisine. In addition, the land is adja-cent to Lexington Center which boasts, Fitness 19, Subway, State Farm and Fiesta Cancun Mexican Restaurant. All of which create a great deal of ac-tivity and traffic to the area.  The land is also across from the Goat Hill Park base-ball fields; which host numerous of community sporting events and thus creates a hotbed for con-sumer activity during the spring, summer and even fall months.